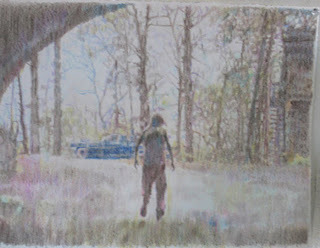 This Thursday at Howard House, my friend Gretchen Bennett has a new show opening called, "Hello." The theme is Kurt Cobain and the pieces are amazing! Gretchen works is always fresh, always inventive and always amazing! 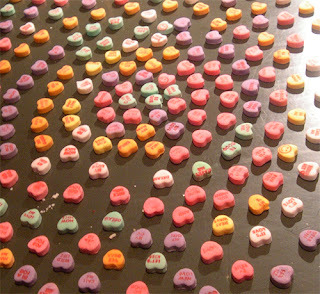 This year, instead of dinner, I went to a Valentine's Day Party. Roy McMakin, Mike Jacobs and Jeffry Mitchell cohosted a fun art party. Emily Gordon made the above "installation" piece. After a hard drive crash last summer left me without MS Frontpage (yes!, i make my website with frontpage), it's been a while since i've updated my website. when craig (thank you thank you thank you!) fixed it, he didnt have frontpage and i had thrown my copy away. so i finally just broke down and got a used copy on amazon. here is a new version -- finally! Yesterday was a great art day! I started off by seeing Dawn Cerny's show. It was really great. But I think I think I love her work even more when it's just her stuff. The owls and mourning dresses and accompanying texts and ephemera were great and additive, but my favorite pieces were Dawn's. I just love her stuff so much. Any my gawd, Jean-Luc Mylayne -- wow! Then I went over to the Frye to see the R Crumb show. I haven't ever seen such a varied cross-section of exhbition-goers -- even at S.A.M.s re-opening. Then I went to see Multiplex at Western Bridge. Skillet was there and they were serving poutine. I tried some of a friend's. It was good -- but I think Smith has the best poutine I've had. Yann said he had better poutine in Montreal and Dave replied, "Hmmm! Are you having drinks with the queen too?" and it was really funny. Last was the Hidetout. We were going to try to make it to Grey Gallery & Lounge -- but it was almost 9;15 (on a Friday night) so I had to go home to bed. Dawn Cerny. 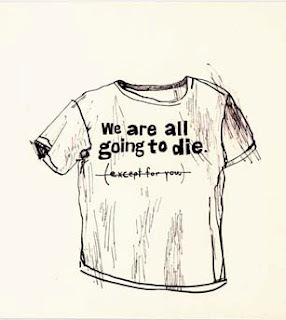 Going to Die Shirt. 2007. Ink on paper. 11 x 10 in. Courtesy of the artist.